Bamboo roof on rice hull guesthouse in Thailand. Maggi McKerron is building guesthouses with bags filled with rice husks (hulls) in Chiang Dao, Thailand. Here is her latest report. I have 10 buildings, all round, mostly 5 meters across, some a little less. Rice husks (hulls) are not load bearing, so the buildings are post and beam, with bamboo trellises on which the bags of rice husks are attached making the walls. 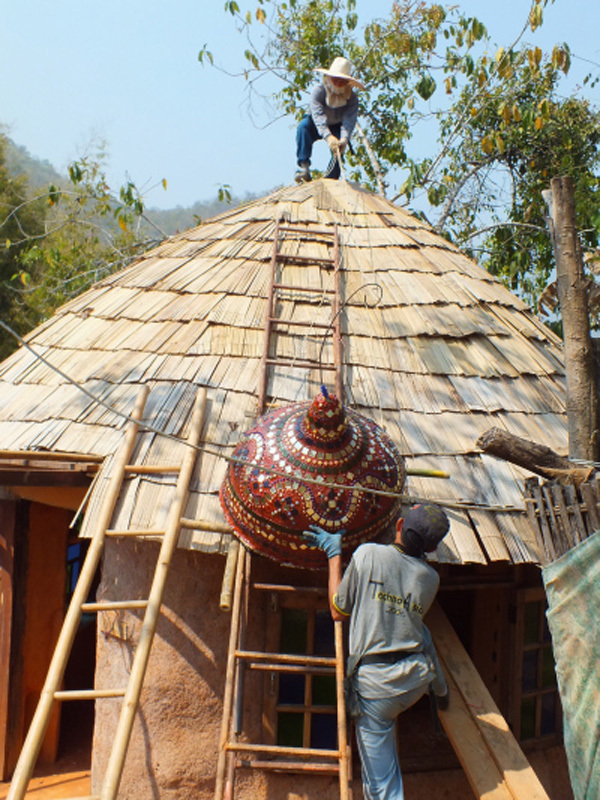 4 of the buildings are domes, using a mix of rebar and bamboo to create the dome, then attaching rice bags, covering with earth and then lime plaster, and covering that with bamboo shingles. Rice husks work well during the monsoon, drying out the air in the buildings. The website below shows pictures of the BnB aspect of Chiang Dao Roundhouses. The Blog shows some pictures of my house as well. Kelly Hart’s earthbag house was one of my major inspirations! I realised you could make a cosy liveable house from natural materials in any shape you wanted. Liberating concept for me. I don’t know if you’ve come across this info Maggi —- A species of Bamboo found in Vietnam , Bambusa Stenostachya . Structures using this material , untreated , are still standing after 50 years . A boric acid treatment is expected to enhance life further . Also I read somewhere that one should soak the bamboo in plain water for several days before the boric and also bash out the joints to allow full penetration . Do you do ? I am hoping to start on my first rice hull building here in West Sumatra shortly . My experience is limited to one house of adobe in Australia . Not sure what Maggi does, but from what I’ve heard very few builders in Thailand take steps to preserve bamboo. If it’s encased in a wall system and covered in plaster then it should last a fairly long time. The #1 thing is to prevent water damage. In most cases, I recommend pitched roofs with wide roof overhangs, not domes — unless you’re in a desert. Thanks for that . I’m not even confident that deserts won’t flood these days . Most of the 5 cm plus whole bamboo I used originally that is still exposed 5 years later is perfectly OK. but not the split bamboo. Now I use a borax/boric acid dip and soak cut bamboo and split bamboo for a couple of days. Nothing else. All OK so far! 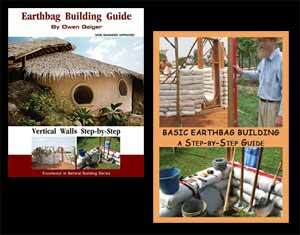 I am almost finished a step by step how to build a rice husk bag building in Thailand – already someone is using the draft as a blue print to build their house and its coming along very well. If you are interested send me your email and you can help me by using the book to build, and letting me have your comments as you go. Glad to hear your building guide is almost finished. Be sure to let us know when it’s ready and we’ll do another story. And… thanks for keeping up with these comments and answering questions. Thanks Maggi . Yes I noticed with excited anticipation — your writing project .I will certainly be a customer .I have just finished reading Kaki Hunter , The tools and tricks …., which is excellent . With regards to the kind offer of your manuscript — For the sake of brevity in previous communication I said I was about to ” shortly ” start on a Rice Hull build here in West Sumatra . The longer more accurate story is that I first will build a small earth bag Round House on the north coast of NSW for my daughter .Then I will do the Rice Hull structure here on a wonderful block of land in the mountains . So in terms of giving you feedback —it would be probably 6 months off which I imagine would be too late to be useful for you . I suspected you were contemplating a book because of the brevity in detail on your blog .I am curious why you omitted the barb wire in your builds . I built Post and Beam mud brick and I ran barb wire to the posts . I guess you figured that the ties to the Bird Cage were sufficient . In my opinion, barbed wire is a horrible material. Where possible I like to use natural materials. I use wood or bamboo stakes through the bags, every second row, stakes about 30 – 50 cms., plus the string ties. The bags are not going anywhere. I was lucky to learn earthbag building from Paulina Wojciechowska earthhandsandhouses.org who has been building naturally (barbed wire is not natural) for 20 years. I am aware that many books and teachers seem to think you can’t do without it – but you can! Paulina also taught me how to build without any power tools. What a gift to know that one can go anywhere and use the materials on hand and build a home! Barbed wire isn’t needed in Maggi’s guesthouses. They look plenty strong to me. However, in many instances barbed wire will strengthen earthbag buildings, especially those in hurricane and earthquake regions. Doesnt the rice hulls mold up in the tropical humidity? Also what about the fine dust from the hulls? How is the bamboo shingle roof done? Never seen it done here. I was thinking about doing this tho. Rice hulls have a coating that protects them somewhat from rotting. (This coating protects the rice kernel inside the hull.) They will rot if kept in a wet environment, but they can last a long time inside of a dry wall. It’s important to prevent roof leaks. The bamboo is split, broken open and nailed flat on the roof after soaking in borax. I’m almost certain you can find details on the Internet if you search for bamboo roofing or bamboo shingles. Let us know if you find a really good article with photos or a good video. My earth plaster is several coats and at least an inch thick. This protects the rice husks from getting wet and also allows them to dry if they somehow do. Also rice is a desiccant and comparing an earthbag building that I have here with the rice husks bags the latter is dry in the monsoon, and the former very damp. That’s good. You have a double layer of protection with the roof and the plaster. Plus the coating on the hulls offers protection. I assume there’s enough space to crawl between the walls and roof to patch any holes. Earthbags should not be damp if they are raised off the ground on gravel bags and protected from rain with a wide roof overhang. Moisture will wick up through concrete and stone foundations and cause dampness. Working with what is avanilable for you!! I love the look of this bamboo roofing. Perlite could be used instead of styrofoam in the ferrocement mix. Perlite is a natural mineral that’s been heated until it puffs up like popcorn. Thank you Owen, for posting this. I would love lots of people to start using rice husks/hulls. It is such a pleasure living within these walls. Can one get Perlite in Thailand, and if so what is it called in Thai and what kind of shop will sell it? I would much prefer to use a more natural product. Yes, it’s in Bangkok. It’s a specialty product, so you’ll have to get a Thai to track it down. We had to buy a big bag (about 30″x36″). They can probably put it on a bus and ship it to you. And I agree about building with rice hulls and other lightweight materials such as scoria. As one gets older you really appreciate how much easier it is to work with. You might consider hiring a videographer to document one of these latest domes. I think there’s a market for this sort of thing, but currently there’s no detailed info available. Book coming up with lots of pictures. So far I am making a pdf so people could just download. When I hold my next workshop I will make a video. Congrats to her with that hard work paying off! That’s really a good idea with BnB. I’ve followed this story for a few years and really like seeing the progress. This latest design looks very good and very practical.